Adam Rothenberg, Miss Richfield 1981, Paul C. Focazio after "Miss Richfield 1981: Sweet & Sour: Made in China" at The Crown & Anchor's Paramount in Provincetown, MAThe Crown & Anchor is on fire with shows in Provincetown, MA! For a second night in a row, I took in another one of their sold-out shows, Miss Richfield 1981 Sweet & Sour Made in China. This energetic and lively show is fueled by the talents of the extremely talented Miss Richfield 1981. With strong comedic timing and powerful vocals, Miss Richfield engulfed the crowd from the moment she entered the room. Detailing her possible exit of the United States, Miss Richfield takes the audience around the world with songs, games, and lots of comedy. 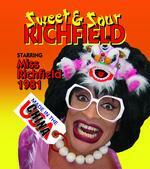 Miss Richfield 1981 Sweet & Sour Made in China is another show for those who can handle off-beat and darker comedy. Miss Richfield has found a humorous way to make fun of everyone. My favorite part of Miss Richfield 1981 Sweet & Sour Made in China was her interaction with the audience, which happened throughout the whole show. Miss Richfield was fast on her feet with quick wit comebacks when playing with the crowd. She got the laugh every time she spoke with someone. It takes a real talent to get that kind of reaction. The other aspect of Miss Richfield's show that I loved was when she sang. Miss Richfield's vocals are unreal...big, powerful, and controlled. When she sang, the sold-out crowd listened! I've seen many drag shows in my lifetime and while many of them are great singers, I haven't heard anyone quite like Miss Richfield. Hearing her sing, made me want her to do a whole show of songs. Maybe somewhere down the line she will or will release an album of her songs. That would be terrific! Miss Richfield 1981 Sweet & Sour Made In China, plays at The Crown & Anchor's Paramount. The room is huge, at least double the size of Crown Cabaret. Miss Richfield filled it to capacity. I loved the set up of this room because it felt like an intimate, yet grand concert room. The Paramount fit perfectly to the style of Miss Richfield's show. If you are looking to see a very dynamic performer, with excellent comedic skills and a fantastic singing voice then I highly suggest checking out Miss Richfield 1981 Sweet & Sour Made in China at The Crown & Anchor: Paramount in Provincetown, MA (247 Commerical Street). She plays through September 21. Click here for tickets! For more on Miss Richfield 1981 be sure to check out http://missrichfield.wordpress.com and follow her on Facebook and Twitter!